Having someone to work with, collaborate and to bounce ideas off of is something that I feel is very lacking in the world of blogging. Maybe it’s just me or perhaps my way of going about things that brings about the belief that most bloggers are not interested in working together for fear of competition or plagiarism or whatever goes through ones mind. Personally I’m not really out to compete with anyone and I know that everyone has their own style, some styles might be similar or some may contrast drastically. We’ve all got our ways and that’s what makes things exciting and unique when you’re browsing Facebook, Twitter, Flickr or whatever social media you might be attached to. There are so many out there and probably will see more to come in the future as technology advances. What might we see in the future? It’s a very good question. My good friend and at times partner in crime, Lucky Spiritor created a very cool scene that inspired me to complete a visual I had in my head for a long time but never knew exactly how to go about it; that is why for the background of this blog the credit goes completely to him. You can find the blog he did with the scene by clicking HERE. There are a lot of elements in this post so I’m a bit afraid of getting too wordy in my writing about what you are seeing. Like my friend, I have thought of a series of visuals that connect together and this is the first of them which I am going to call “Battle Scars”. It’s almost normal now for us to read about some type of fighting overseas and that US Soldiers (and also those from other nations) being killed in active duty. First and foremost if there’s anyone who reads this that has served or is currently serving in the Armed Forces, I thank you for doing what you do to defend our liberties and keep us safe from those who might harm us. Most of the personal things on me are products I have been using lately and can be filed under the “previously blogged” category. The more I start using these on a consistent basis, I may add a page on the site which will state that unless I credit it that I’m going to be wearing them. I am wearing a new pair of eyes which I do have a better view of that you will see as you get deeper into the blog. I’ll tell you more about them after the photo which accompanies them. 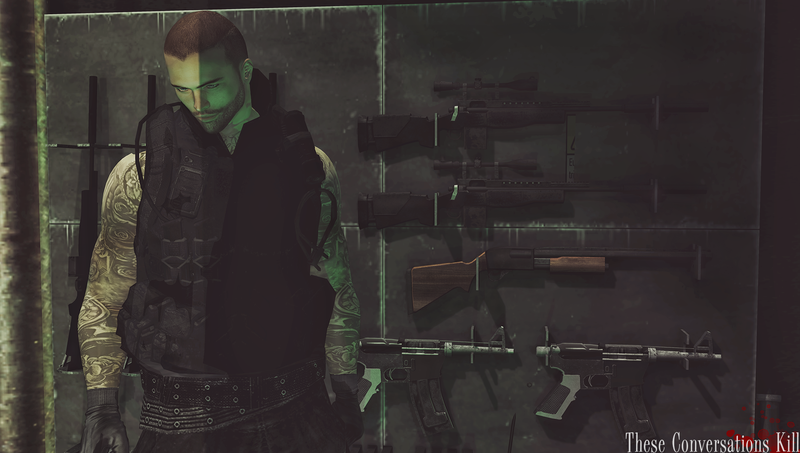 Finding good soldier/mercenary gear is difficult to find and there are very few creators in world that handle these things which led me to begin scouring the marketplace. 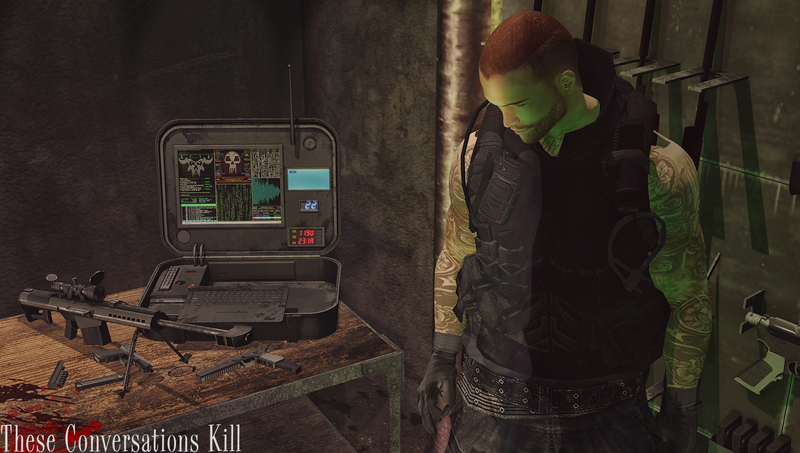 There I found the tactical vest and pants that I am wearing which are very well textured and made and the vest can be resized to help fit just about any mesh body out there. The gloves I’m wearing are a past group gift from E-Clipse Designs but the store may still have them up with other past gifts. They are bento enabled and have an included HUD that you can change the color from either black or brown with the click of a button. The wall of guns is from a gacha machine that is the brainchild of both the xin and Toro stores. I believe that it was created as part of a GTA V / Bank Heist type set which included a bunch of different gadgets and items. Though sticking with this wall, I feel there is plenty of firepower for a massive skirmish in whatever war zone this picture is based in (I haven’t decided yet where it would be). For a soldier what can be more important than a wall of guns? More guns! As you can see there are several different handguns as well as a slick looking sniper rifle (a Call of Duty fans dream I’m sure). On top of that throwing in some tech that helps an operation go as smoothly as possible. The rifle and hand guns (along with the magazine clip + compensator) belong to the very well crafted and detailed “Sharpshooter” gacha from BAMSE who specialize in making great weapons for gachas. I’m pretty sure that most males that blog these kinds of scenes have items from their machines (as well as anyone that might role-play). The brand doesn’t slouch when it comes to making these interesting pieces and definitely helps add a little more definition to a scene. The case comes from the same gacha machine as the gun wall from xin + Toro, while the table itself comes from [NikotiN]’s “Dealer Kitchen” set. The grunge type look of the table works well with the gritty scene of the remote location that houses this tactical operation. Avi-Glam did not just release skins at this years Skin Fair, they also released a min-set of eyes called the “Prestige” eyes and are exclusive to the event until it ends on the 26th of March. There’s still plenty of time to get this set which offers 15 different color irises with the choice to have small, medium, or large sizes. For those of you with CATWA and Omega enabled eyes, there is a HUD for you as well as one for regular mesh eyes that are also included. I have a good idea where this theme of blog entries is going to go but until the rest of them are done and posted I truly don’t know if they’ll be quite what I have seen in my head. Though it will be definitely worth the effort of trying just to see how far I can allow my mind and creativity go and give a little bit of life and story to them. This blog had a lot going on for itself with all the different gacha items in the background and it was really cool of Lucky to allow me to use the set he had created for himself to build a visual from my own mind. I’m not the best decorator when it comes down to it and usually prefer something already on a sim or a backdrop. Sometimes I am able to push myself to create a scene that even I am surprised of but it doesn’t happen often. Now that I’m done getting carried away, I’m going to leave you to what I consider to be one of the most important parts of the blog: the credits. Be sure to click that link to Lucky’s blog as well because he does some great stuff as well.